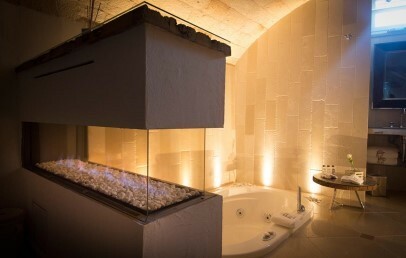 granted by this luxury designed Hotel. Monopoli is one of the liveliest and most active coastal cities of Apulia. The charming Don Ferrante is located in its most exclusive district, on the reef, and framed by the deep blue of the Mediterranean sea and the characteristic streets of the city center. 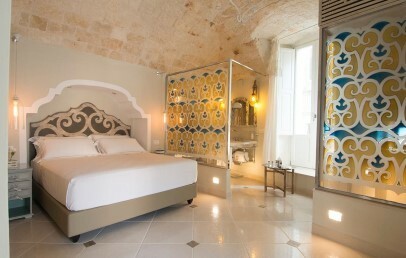 The boutique hotel Don Ferrante is only a few minutes from the most beautiful beaches of Apulia, the ancient city walls and castle of Monopoli. You can quickly reach cathedrals and rupestrian churches, find local products, natural parks and the many folkloristic events which take place throughout the year. 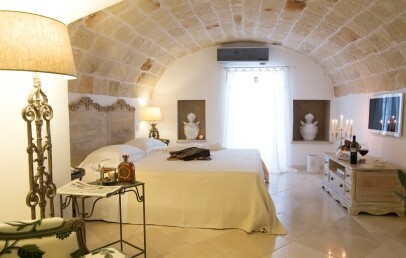 Don Ferrante is an ancient fortress, carefully restored and furnished with elegance. 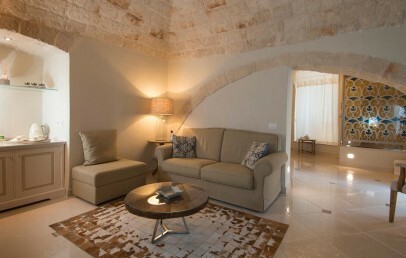 The use of stone and the typical apulian lime mortar with crushed pottery (cocciopesto), reflects the latest bio-architectural techniques that respect the original structure, its charm and its historic value. The charming hotel Don Ferrante is characterized by a romantic and soft decor, light colors and details of the highest quality. You will be amazed by the soft lights of the 14 chimneys that illuminate the beautiful terrace, the romantic view of the sea, the solarium and the relaxing outdoor whirlpool bath. Don Ferrante welcomes its guests with its 10 charming dwellings, all furnished with style and equipped with numerous comforts, like flat-screen satellite TV, free access to the internet, bedding of the highest quality, bathrobes and slippers. Some rooms are located in the Luxury Guest House, 160 metres from the main building. Apulia is renowned for the beauty of its beaches and crystal clear sea. The beach of Monopoli is one of the most famous and popular one of the coast, equipped with numerous services and quickly reachable by bike or car. Not far from Monopoli you have the chance to discover the beautiful coastline of Giovinazzo and Polignano Mare. At about 100 meters from the Don Ferrante, nature lovers can go to the small rocky cove (not equipped) or to others small coves nearby. Those who prefer the beach facilities can instead choose Capitolo beach, affiliated with the hotel, which is approximately 7 km away. Don Ferrante organizes 2 beach shuttle a day, one in the morning and the other in the afternoon / evening for the return. Guests can rent beach umbrellas and sun loungers on the spot. Locanda Don Ferrante - just a short walk from the hotel away, between the sea and the old town located - is characterised by a genuine and typical Apulian culinary tradition. The Mediterranean flavours and scents will be enhanced by the carefully selected local and national wines and in the summertime, the restaurant is set on the beautiful panoramic Don Ferrante terrace, at the top of the hotel. Drinks are served all day long at the Lounge Bar. The restaurant is open every day except for Monday oder Tuesday, from the beginning of June until the end of August; during the rest of the year. The Hotel staff will be happy to suggest the best local restaurants where, as a guest, you will be able to taste local delicacies. Breakfast is served in the Locanda Don Ferrante Restaurant or, on request and upon extra charge, in the room. There is a rich buffet of local sweets, cakes, cheeses, cereals, cookies, pies, fresh fruits, fruit juices, and hot drinks. At complete disposal of the guests of Don Ferrante there is a panoramic whirlpool swimming pool and a solarium, both in the terrace, where you will also find a snack bar. A highly professional staff will arrange your itineraries for tasting and wine tours in the farms of Apulia, to discover the flavors of local typical products. You can rent a classic Calessino or a fun “treruote” that will follow you around the old town. Among the other exclusive services of Don Ferrante you have the opportunity to be accompanied by a personal shopper or take a body massage in your room. Double rooms with queen-size bed for single use or double. 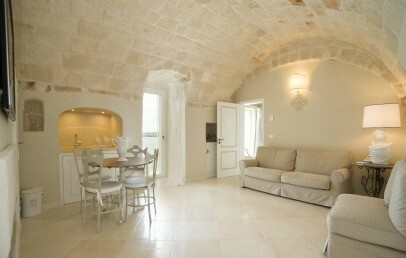 Located on the first floor, they are characterized by the stone walls with light colours and details of high quality. 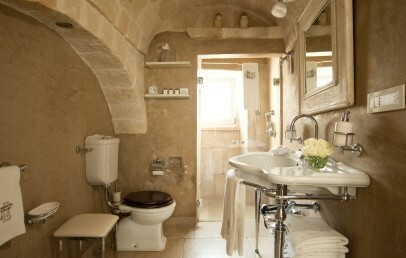 The "open-plan" bathrooms, with king-size shower and exclusive taps are made of apulian earthenware. The window of Dimora Junior rooms offer a sea view. Double rooms with king-size bed equipped with mattresses with pillow top, it is possible to arrange 2 separate beds on request. 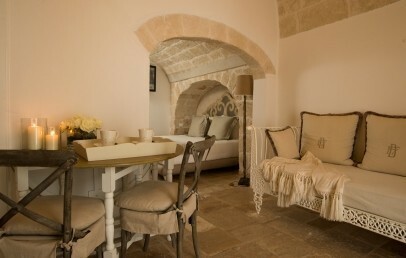 Located on the first floor, they are characterized by the stone walls and the romantic and soft furnishing. Light colours are prevailing and the details are of the high quality. 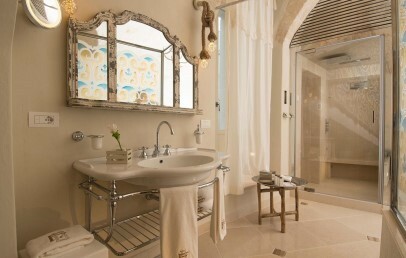 The bathroom has king-size shower, exclusive taps and made of apulian earthenware. 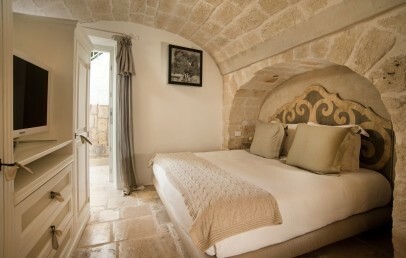 Some Dimora Superior rooms have a balcony or a window facing the streets of the old town. 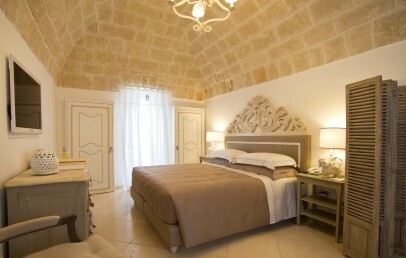 Only one of the Dimora Superior room has a small balcony "Juliette" with sea view. Double room with king-size bed. 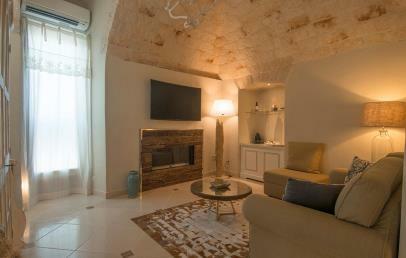 Located on the first floor and are characterized by the stone walls, romantic furnishing, light colours and details of high quality. It has two different rooms with a second bedroom with a single bed or a living room with sofa. 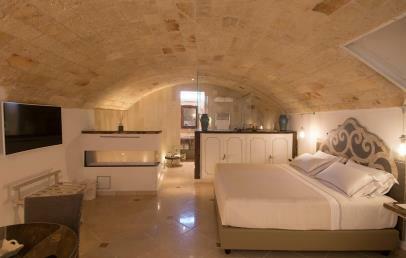 The bathroom has a king-size shower, exclusive taps and made of apulian earthenware. 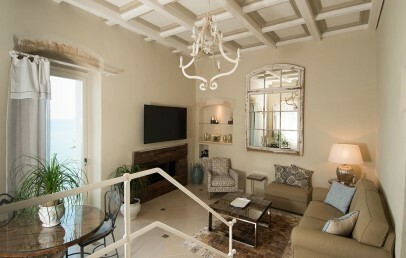 The windows of the Dimora Deluxe, located on the first floor, offer a sea or a garden view. Master bedroom suite with king-size bed with pillow top mattress. Finely furnished, original and unique, it is equipped with every comfort from 2 satellite TVs with screens to bed linen of high quality, with bathrobes and slippers. An elegant electric fireplace and a king-size bed ensure the best charm. The Suite boasts a spacious living area with sofa, table and chairs. 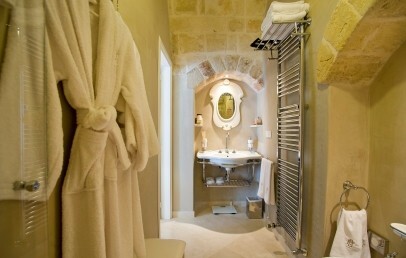 The bathroom has a king-size shower, exclusive taps and made of apulian earthenware. Don Ferrante's Suite features a long sea view balcony equipped with table and chairs. 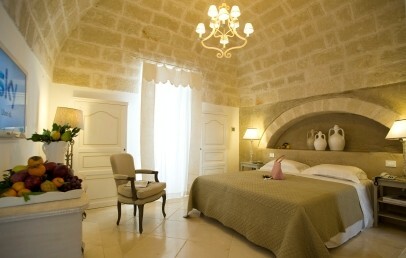 This room is located in the Luxury Guest House, 160 meters far from the main building. 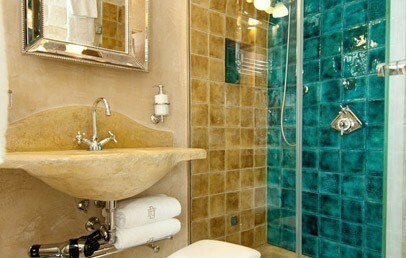 The Suite Charles V is a prestigious Guest House divided into two rooms. 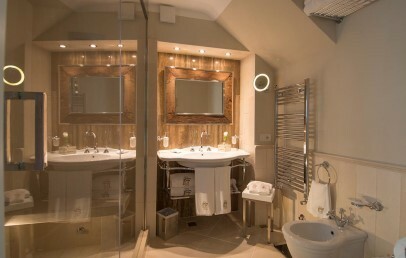 The bedroom with king-size bed with pillow top mattress and bath with a king-size shower with steam and chromotherapy. A lounge with fireplace, smart LED TV curved Ultra HD, iPhone/iPod docking station, Nespresso coffee machine and tea and coffee making facilities, which overlooks the small balcony offering an incredible view over the sea and the castle Charles V. It also offers an exclusive Roof Garden of 38 sq.m., equipped with sun beds and a seating area. A luxury Suite with homelike atmosphere. It has a lounge with fireplace and a glazed door that leads out to the private patio and offers a nice view over the castle Charles V and the sea. 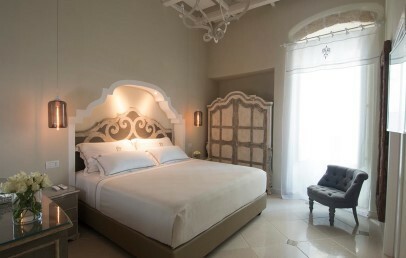 The bedroom has a king-size bed with pillow top mattress and a bathroom with king-size shower with hammam and chromotherapy. The Suite features smart LED TV curved Ultra HD, iPhone/iPod docking station, Nespresso coffee machine and tea and coffee making facilities. The combination of tradition and modernity is the property that distinguishes this accommodation with welcoming and warm colors. The "Il Sottano" has ancient roots and lies under the street of the charming "Vico Castle". The interiors have vaulted ceilings of tufa, a fireplace, a king-size bed with pillow top mattress, iPhone/iPod docking station, LED Smart TV curved Ultra HD, Sky, Nespresso coffee machine, kettle for tea and coffee. The bathroom has a jacuzzi, a large shower, hairdryer. Double room with king-size bed located on the ground. 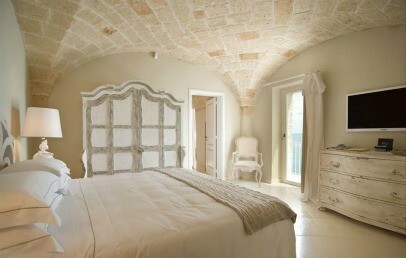 Characterized by the stone walls and the romantic furnishing, light colours and quality details. It has a bed room and a living room with sofa bed. 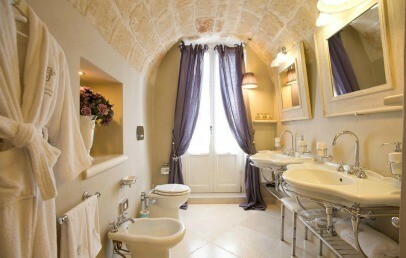 The bathroom has a shower, exclusive taps and are made of Apulian earthenware. This Dimora Deluxe has an independent entrance and access to the road.